Circle of Good Minds are directly involved in the activities and affairs of HYU; duties and functions are identified by (but not limited to) service. All are Elders (18+), Male and female and not seeking recognition. The Circle consists of at least 5 members with a limit of 12. Hekalu Ya UKUUNKI currently offers spiritual healing services, programs and sustainability initiatives. Our spiritual services are meditation, self awareness study and monthly community spiritual gatherings. HYU has a monthly Unity & development day for members and is open to the community every 3rd Wednesday (Except in December). At each monthly development session all can learn more about HYU and how to get involved. During each gathering one of the Seven Principles is highlighted through the use of the Kwanzaa Cycle calendar. For more information fill in the interest form to the right. 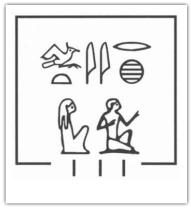 This ancient Kemetic hieroglyphic symbol reflects our ancestors appreciation for knowledge as the fundamental way we understand our humanity, and also the indispensable way by which we realize our humanity in the more meaningful and expansive ways. The appreciation for knowledge as the key to our creating a context of maximum human freedom and human flourishing. In the classical Afrikan conception, education then is a practice process which cultivates Knowledge, transmits tradition, and fosters reasoning which provides opportunities for students to develop and prepare for a meaningful contribution to the ongoing project of bringing, sustaining and increasing good in the world. This begins with and is based on a conception of self which is rooted in relationship and the responsiveness and responsibility to others and the world this requires. Hekalu Ya UKUUNKI began as True Reflections and Freedom (TRaF). TRaF was an Afrikan heritage education organization. The focus of True Reflections & Freedom was to fulfill the need to expand heritage to youth of Africa Descent. The original intent was to be an international cooperative. A cooperative allows for organizational operations to be owned and governed by the people it serves instead of other external governments. TRaF was incorporated as a non-for-profit from 2010-2012. Continuing with the original intent, Hekalu Ya UKUUNKI is an international, self-governing, self-supported, Universal Spiritual Temple established to acknowledge the Creator and restore an ancient spiritual foundation for the healing of indigenous peoples of America and Africa. Located in the Chicago Territory, we provide a sacred space to advance Ancient spiritual understanding and practices to become spiritually whole to transcend ones full potential on Earth. Hekalu Ya UKUUNKI was established in Tybi (November) 12, 6252 (2012). We gather weekly on Moon’s day (monday) for meditation & Sun’s day (Sunday) to study from Husia. Every first Sun’s day we collaborate with other Afrikan spiritual temples in the Chicago Territory. Hekalu Ya UKUUNKI is membership based and we do not recruit. Our mediation and study is open to the public and we look forward to meeting you.